Design historian and senior lecturer at Kingston University, Cat Rossi, give us her personal and academic perceptions of making culture so far on 'Living Research: Making in China'. What counts as a makerspace? We've now spent a week in Shenzhen and have visited a host of these sites that are springing up across this manufacturing mecca. What has been striking is not just the specific definition of the makerspaces we’ve seen here so far – one which is both narrower than and distinct from that of the UK - but the plethora of making that goes on outside of these spaces, much of which is hidden in alleyways and side streets and undervalued by the city’s innovation mantra. What follows are some early reflections on what we’ve seen so far in Shenzhen, and the questions our experiences have raised; both about how you define making in and within different cultures, and what this means for those communities outside of officially sanctioned spaces and typologies of making. Making has become an internationally fashionable term in recent years. In the UK it has become a buzzword to describe associated values of authenticity, the artisanal, and a return to a hands-on relationship with materials and small-scale production after decades of detachment in a digitally permeated, mass consumer economy. In Shenzhen, as visits to Huaqiangbei International Maker Centre and MAKE Mountain indicate, making has been equally co-opted, albeit here to describe technology-based enterprises. Seeed Studio provides hardware, and production and distribution services to enable an international community of hackers and maker entrepreneurs. These start-up focused makerspaces fit well in Shenzhen. This is a city driven by the mantra of technological innovation, with multi-storey buildings devoted to LEDs, microprocessors and other electronic tools and components. Even if we haven’t witnessed as much making as you might expect in a “makerspace”, visiting these spaces has been fascinating, particularly as they make clear how much Shenzhen’s makerculture is implicated with the city’s gargantuan manufacturing capability. The importance of this proximity to the primary materials of industrial design for designers, manufacturers and entrepreneurs alike cannot be underestimated. It bodes well for Shenzhen’s future, particularly if its embryonic design scene is able to mature and move the city on from its endemic culture of copying (a culture that is in itself central in China’s making culture more generally). Of course the state and privately funded makerspaces we’ve visited represent just a fraction of the making that goes on in Shenzhen. 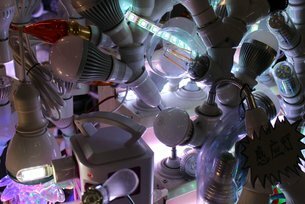 It has been hugely valuable to seek out the making that goes on more generally here, not only to understand its makerspaces in broader socio-cultural, economic and political contexts, but also to think about how the making that predates official makerspaces but which could help their future growth. Tucked down an alley in Dongmen market was a row of sewing machines out in the street. Largely staffed by women, they were both repairing clothes and making to commission, as well as finishing off batches of jeans destined for other parts of the city, if not the world. The area’s shopping megastores were also a hive of industry, with skilled tailors (who we commissioned some clothing from) businesses for designing and printing clothing labels, t-shirts and shop signs, and women sewing on and unpicking yet more clothing labels for low-value garments in cramped shops right in front of consumers. Yet this frenetic making culture was most evident in the Urban Villages. These are the original inhabited sites of Shenzhen, a city of 14 million people which less than a century ago was little more than a fishing village. The land in these areas is still owned by the same families, who have since sold their plots and had them replaced with 7 to 8 storey buildings (their height is limited by a lack of lifts) of apartments and businesses. The villages are hard to spot; low-rise islands concealed within an ever-expanding sea of skyscrapers, continually threatened by the city's unstoppable march of progress. Most have either already been destroyed or have been pencilled for demolishment. Together with Fu Na, an urban planning researcher at the Shenzhen Design Center, we visited two Urban Villages - Gangxiau and Cai Wu Wei. These fairly typical Urban Villages are inhabited largely by a transient population of migrant workers who constitute the city’s support structure. The villages are sites of small-scale entrepreneurship, many of which are making-based. These include workshops for repairing everything from bikes to mobile phones, as well as clusters of workshops that constitute micro systems of manufacture. For example, distributed within a few hundred metres in Cai Wu Wei were workshops engaged in nearly every aspect of the business card industry; from a design firm to printer ink and card retailers, to companies devoted to printing and embossing, as well as waste and recycling specialists. The production tools are largely low-tech, but the orders are received online and the different producers communicate via an instant messaging service. This network of physically proximate, small-scale specialist manufacturers constitutes an agile and efficient manufacturing ecosystem akin to Italy’s celebrated distretti industriali (“industrial districts”), which are well recognised as a key model for post-Fordist economies. Seeing these manufacturing ecosystems operating right in the heart of Shenzhen, in areas threated by forces of economic innovation, suggests that the city could do well to learn from, rather than eradicate, this lively making culture. Other visits have been equally valuable to understanding the city’s making culture. Shenzhen Museum provided a historical perspective on the city’s love affair with innovation and insights into the importance of the state in its astonishing industrial growth from the late 20th century onwards. It was fascinating to see early examples of the computers, phones and other tech products that have been produced in the city’s factories since the 1980s, and left me wondering what would be collected to record making in 2015. Significantly, craft was absent in these galleries, but it was present in the folk culture section on the floor below. I see this separation as part of a broader absence of the city’s craft heritage; what has happened to the basket weavers, net makers and other crafts that once defined this former fishing village? What implications could their loss have for the city’s future? Recognising the creative (and innovative) value of Shenzhen’s earlier craft landscape could provide a key tool in the development of a desirable, locally rooted design culture. We’ve spent just a few days in Shenzhen so far, and I’m looking forward to seeing a greater variety of maker spaces on our return next week, after a couple of days in Shanghai. Immersing ourselves in Shenzhen has already proved valuable, although there are more aspects of the city’s maker culture that I feel need to be engaged with to fully understand maker spaces and the unofficial making culture here. These including locating its craft traditions, and earlier design history, as well as engaging with local craft, design and engineering education, to understand attitudes towards making, design and creativity more generally. As a design historian based in a university it is these questions around making-based education and the past that I think could be important for securing its future as a manufacturing powerhouse. Catherine Rossi is a design historian interested in researching, teaching, and communicating ideas about making in design culture, based at Kingston University.